In news that probably surprises no one, the Manor Formula One team will be shutting down. Funding they hoped to raise to participate in the 2017 season never materialized, per Road & Track. Workers have been sent home and the team will cease operations by the end of the week. 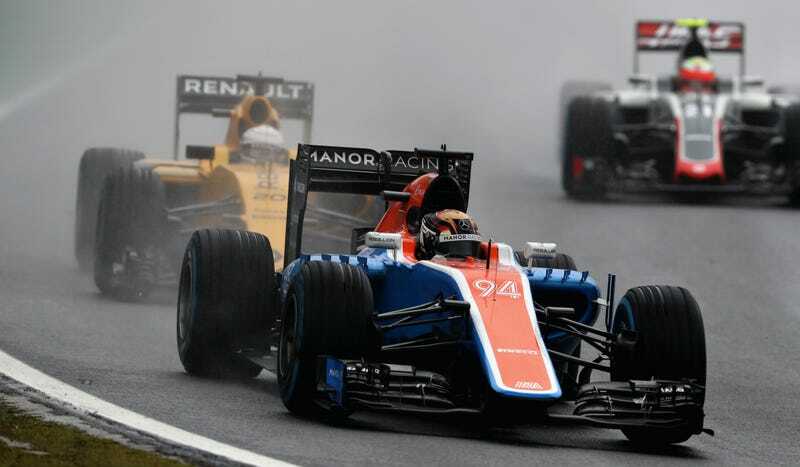 The company that runs Manor Racing’s team operations, Just Racing Services Limited, had already been put into administration, with the business being handled by administrators at FRP Advisory. Progress had stalled on finding a new buyer for the team, so the decision was made to cease trading Just Racing Services and shut it all down. There was enough to pay all 212 staff members’ salaries through January 31, but not enough to keep the team running, according to a statement by FRP Advisory published on Motorsport.com. This leaves only ten teams on the Formula One grid for 2017. Manor finished eleventh in the 2016 F1 constructors’ championship, meaning that they received no prize money. The $13.5 million loss from finishing eleventh instead of tenth was enough that the team was forced to find new investment (which they didn’t) or close (which just happened). The team, then known as Marussia, was saved from closing in 2015 after entering administration then. It was reborn as the Manor team, and while it never quite took off, we’ll miss this team anyway. The only American driver to compete in F1 in recent years, Alexander Rossi, got a chance to race with Manor before going on to win last year’s Indianapolis 500. Vaya con Hispania Racing Team, bros.